Pulling Sheila, the circus elephant, out of the lagoon. Price $20 per book including $3 postage in Australia. Contact me for more information or for international postage rates. If you want to send the book as a gift, both payment options allow you to change the shipping address. Or just let me know by email or phone. Don Gray, an esteemed senior citizen of Thirroul, phoned me one day to ask if I could ‘paint pictures of events for which there are no photos’. Well, I was intrigued. It turned out he wanted some illustrations for a book he was planning to write about the town’s history as he remembered it from living here for most of his nearly ninety years, and from the stories he had been told by the ‘old-timers’ in his youth. It was quite a learning curve for me – history, costume, geography, coalmining – even elephants and their circus harness! Don loved to tell how his mother remembered losing him the crowd at the circus, but eventually found him – four years old – cuddled up to the elephant, arms around her foreleg. This particular story of an elephant ‘escaping’ and wandering into the lagoon seeking the good greens on the far bank was well remembered by every child in the town (and the newspaper report is now available on the National Library of Australia’s website). 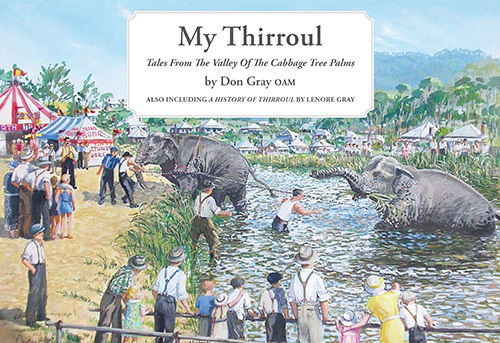 My Thirroul is a collection of Don Gray’s stories of Thirroul. He lived there from the early 1920s and in the time since then the town changed greatly. The people of this small coastal town, nestled between the ocean and the Illawarra Escarpment, once relied on agriculture and timber-getting for their livelihood. Gradually, Thirroul became a mining town, a railway town and an industrial town, but in the closing decades of the twentieth century it changed again – and continues to evolve. Don had an amazing memory and within his book are some of the stories he wanted to tell . . . Tales of long ago: of memorable events in his childhood, and of the life led by the mining and railway families of the town.